But they also remain disproportionately affected by poverty, discrimination and exploitation. Gender discrimination means women often end up in insecure, low-wage jobs, and constitute a small minority of those in senior positions. It curtails access to economic assets such as land and loans. It limits participation in shaping economic and social policies. And, because women perform the bulk of household work, they often have little time left to pursue economic opportunities. Many international commitments support women’s economic empowerment, including the Beijing Platform for Action, the Convention on the Elimination of All Forms of Discrimination against Women and a series of International Labour Organization conventions on gender equality. 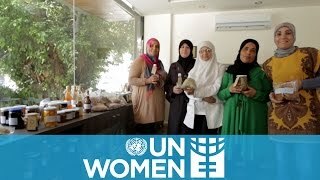 UN Women supports women’s economic empowerment in line with these, and with the growing body of evidence that shows that gender equality significantly contributes to advancing economies and sustainable development. Working with a variety of partners, our programmes promote women’s ability to secure decent jobs, accumulate assets, and influence institutions and public policies determining growth and development. One critical area of focus involves advocacy to measure women’s unpaid care work, and to take actions so women and men can more readily combine it with paid employment. In all our economic empowerment programmes, UN Women reaches out to women most in need, often by engaging with grass-roots and civil society organizations. Particularly marginalized groups include rural women, domestic workers, some migrants and low-skilled women. Our aims are higher incomes, better access to and control over resources, and greater security, including protection from violence. Download a two-page thematic brief on UN Women's work on economic empowerment.